The Best Quality Whey Protein Ever married with the Brilliant Creaminess and Flavor of Sacred Chocolate. 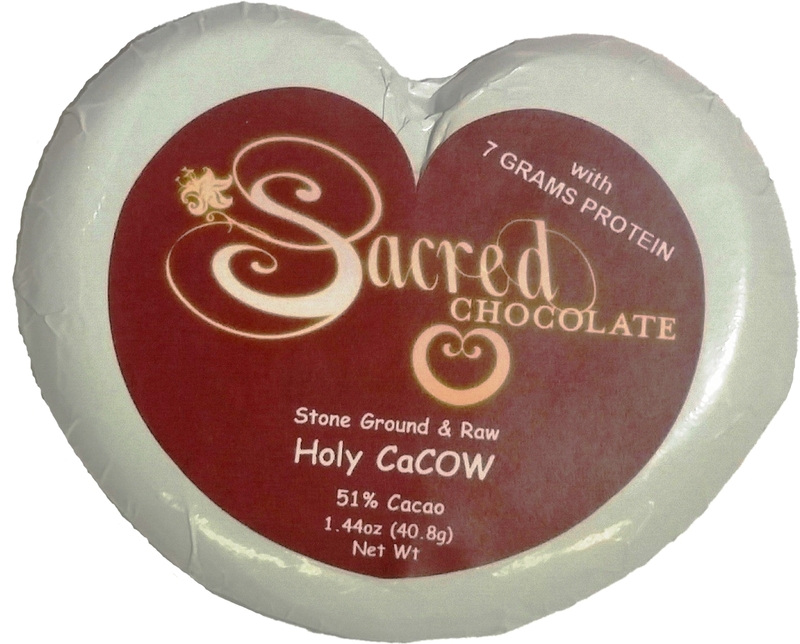 Sacred Chocolate's Holy CaCow heart bar is a true breakthrough in boosting the protein content of a chocolate bar while maintaining a gourmet flavor. This amazing chocolate has 7 grams of protein per 1.44 ounces of chocolate. This bar is a "milk" chocolate at a 51% percent cacao content which includes a special low temperature processed grass-fed whey protein concentrate that is kosher and certified organic. This chocolate bar has been likened to your favorite milk chocolate bar in regards to flavor and texture. Gourmet chocolate plus world-class Protein. Brilliant flavor. Smooth and creamy. Not chalky. Not too sweet. Naturally delicious. Holy CaCow is ideal for muscle nourishment, immune support, exercise recovery, body rejuvenation and neurological health. Why did we Develop a Raw Organic Protein Chocolate Bar? Chocolate and protein are a natural combination. Most chocolate protein snack foods are chalky and taste less than excellent. Holy CaCao is a gift to yourself: a gourmet chocolate experience. Adequate protein assists with muscle-building, neurological health, blood sugar regulation, tissue repair, strength, and energy. When we were developing Holy CaCow our goal was to provide enough quality protein to gain all of its benefits, while at the same time delivering a one-of-a-kind flavor and taste experience. 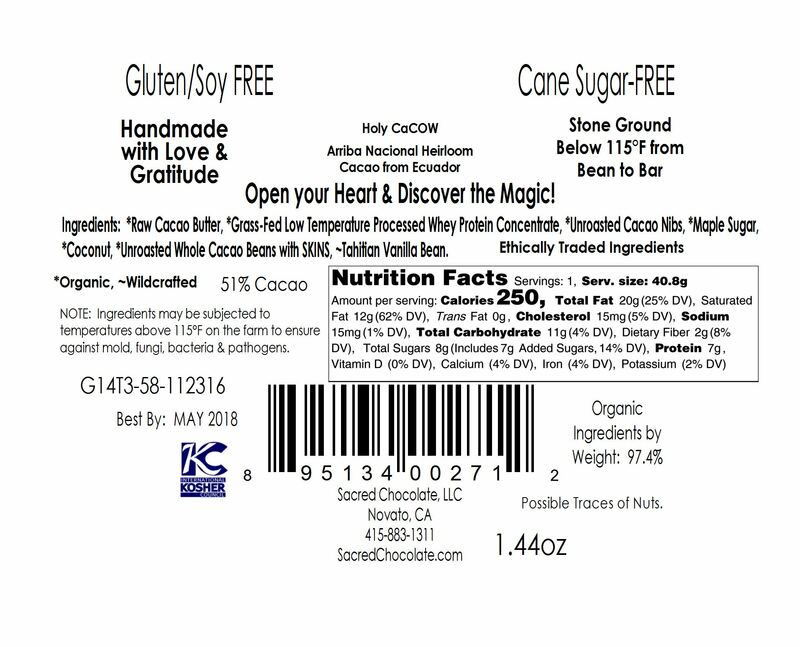 Each Holy CaCow Sacred Chocolate bar contains 51% cacao and 7 grams of protein. The extraordinary flavor and creaminess of this gourmet Sacred Chocolate bar is due to the right balance of organic cacao, maple, and whey protein. Over years of experimenting, we eventually arrived at 51%. This gives us creaminess, texture, and potency, but does not override good flavor sensibilities by being too strong. Why 7 grams of protein? In order to deliver a significant amount of raw protein, yet not lose flavor and texture, we eventually arrived at the magic number: seven grams per bar. Seven grams of protein per bar, may in fact, feel like 14 grams of protein. According to Dr. Gabriel Cousens and the Max Plank Institute, raw protein may be twice as bioavailable as cooked protein. Due to congealing and other damage done to protein by heat, the science indicates we require less protein and absorb more of it, if the protein is raw. Sacred Chocolate’s Holy CaCow is the only gourmet chocolate bar that has these levels of protein and this quality of raw whey protein. The quality of the grass each cow eats determines the quality of its milk, and therefore the quality of the whey its produces. Selecting a whey protein product should be like selecting any other food: one must look for sustainable sourcing, organic certifications, quality controls, and overall conscious production. Whey is supposed to be a natural byproduct of the cheese making process, made from the milk of grass-fed cows. Yet, most industrially-produced whey products, are derived from the milk of GMO-grain-fed cows. As this milk is processed into whey it undergoes heating and acid-washing that both strip vital nutrients and enzymes, creating a “whey isolate” that is often contaminated with synthetic additives, chemical detergents, fillers and even heavy metals. Even most organic whey powders are still high-temperature-processed and isolated. Whey protein made from the milk of factory-farmed cows can be contaminated with hormones, bacteria and toxins, and have significantly fewer nutrients than dairy and whey products that come from traditionally raised cows. Each raw milk dairy farm that supplies the organic grass-fed whey we use adheres to stringent state-mandated purity regulations and monitoring processes and keeps the raw milk in stainless steel containers never exposed to open air. The milk used to make organic raw milk cheese is briefly heated, yet remains far cooler than a typical cheese making or milk-pasteurization processes. To start the curdling process, the milk is heated to 72 ̊C for 15 seconds and then cooled down to 5 ̊C. The thick molecules of fatty acids (that become cheese) separate from the water-soluble whey protein molecules. The whey is then forced through ceramic micro-filters that trap virtually all microbes. The final liquid is then dried as whey powder, using a low-heat process, as well as, no fillers or chemical treatments. The resulting whey powder is added directly to each batch of Holy CaCow chocolate. Mostly due to the dairy industry’s history of toxic production and concerns about dairy allergies, whey protein has undergone significant scrutiny. At the same time, however, research into healthfully-produced whey continues to reveal highly nourishing, superfood qualities. • Muscle-building, brain-nourishing, energy-boosting amino acids including branch-chain amino acids based on leucine. • An array of unique health-giving compounds including: Glycomacropeptides, IGG, Beta lacto-globulin, lactoferrin, serum albumin, alpha lactalbumin. • Calcium, magnesium, and potassium. • Conjugated Linoleic Acid (CLA) — The whey utilized in Holy CaCow contains an important group of fatty acids known as conjugated linoleic acids (CLAs). CLAs are made by friendly probiotic bacteria in the stomachs of naturally-grass fed ruminating animals, like cows; yet cows raised in unnatural feedlots produce almost no CLAs. Sacred Chocolate is slowly stone-ground from bean to bar right in our custom chocolate factory in Marin County, California, which was designed from the ground up to make raw chocolate! Each 1.44oz bar comes in the shape of a perfect golden spiral heart, symbolic of the fact that raw cacao is so good for the heart. This delicious Sacred Heart chocolate bar is hand poured & hand wrapped. All Sacred Chocolate is prayed over by Sacred Steve, the Sacred Chocolate Oompa Loompas and others! NOTE: This bar has NOT yet been certified organic. However, we are using the same organic ingredients that are being used in our certified organic bars. *Raw Cacao Butter, *Grass-Fed Low-Temperature Processed Whey Protein Concentrate, *Unroasted Cacao Nibs, *Maple Sugar, *Coconut, *Unroasted Whole Cacao Beans with SKINS, ~Tahitian Vanilla Bean. Note: This bar has not yet been certified organic by CCOF.